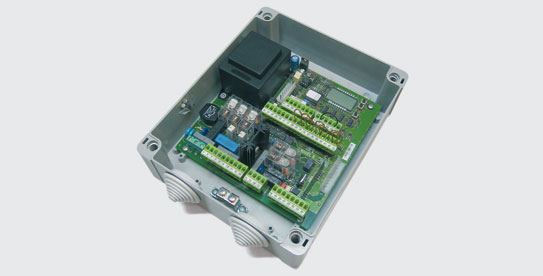 Control board supports one or two motors powered by 230 vo 600W each. A large number of features allows you to perform very sophisticated system. It has an integrated two-channel radio with dynamically variable code with memory for 63 remote transmitter> removable cube connections facilitate execution. Programming is done through the LCD display and three buttons. The control panel also has a backdoor functionality. Housing dimensions 225x183x90 mm.